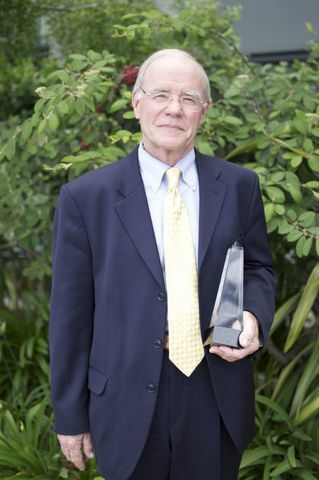 WOODLAND HILLS, Calif. – May 20, 2014 – Northrop Grumman Corporation's (NYSE:NOC) Charles Volk was recently awarded the Kershner Award at the Institute of Electrical and Electronics Engineers/Institute of Navigation's Position Location and Navigation Symposium. The prestigious Kershner Award was established in honor of Richard B. Kershner, the lead developer of the world's first navigation satellite system. The award recognizes individuals who have made significant technical contributions to the modern era of electronic navigation through navigation and positioning equipment, systems or practices. In a ceremony during the symposium May 8 in Monterey, Volk was honored for his work on navigation and inertial sensor systems. "Dr. Volk has been wholly dedicated to advancing the navigation industry, leading to an admirable career at Northrop Grumman," said Pat Antkowiak, vice president and general manager of Northrop Grumman's Advanced Concepts and Technologies Division. "This award reflects the much-deserved respect Charles has earned from his peers as one of the navigation industry's leading experts." Volk is vice president and chief technologist of Northrop Grumman's Advanced Navigation Systems business unit. More than 35 years ago, he joined Litton Industries, now part of Northrop Grumman, and has held several key technical and management positions. Volk was instrumental in the development of the highly reliable ring laser gyro and the first navigation gyro without moving parts, the zero-lock gyro, which has been used in more than 40 types of military jets and commercial airliners worldwide. In addition, Volk led the development of micro-electro-mechanical system accelerometers used in thousands of inertial measurement units and introduced the fiber-optic gyro into Northrop Grumman's production navigation systems, providing high accuracy with lower weight for vehicles such as the Mars rovers. He oversaw development of hemispherical resonator gyros used in space missions such as Deep Impact. Prior to working at Northrop Grumman, Volk refined atomic clocks for GPS satellites. Volk earned a bachelor's degree in physics from Lake Forest College and a doctorate in physics from Indiana University. He holds eight key patents in inertial sensors and navigation systems.